Altered Instinct: Musings of a sleep-deprived mind on writing science fiction. Musings of a sleep-deprived mind on writing science fiction. Ricardo Victoria guests at the blog to share his thoughts about the science fiction genre - as Inklings Press edges closer to publication of its next anthology, Tales From The Universe. I have to say that I have a love-hate relationship with science fiction. I grew up with a steady diet of sci-fi movies as any other 80s child, helped by a father who used to be a trekkie. Thanks to him, I can say that I have watched almost every episode of Star Trek series and the animated series (and yet I’m more of a Star Wars man, who some could argue is more science fantasy). One of the first books I bought as a teenager after devouring anything by Lovecraft was I, Robot by Issac Asimov, a book that nowadays barely keeps itself together after many reads. I have read Jurassic Park countless times, despite the fact that Crichton comes across more of a Luddite or a technophobe than an actual science fiction writer. One of my favorite manga artists, Masamune Shirow, of Ghost in the Shell fame, dwells mostly on science fiction. I doodle spaceships in my notebooks admist boring lectures and meetings. Heck, at one point of my life, I undertook two years of chemical engineering with aims of someday joining NASA (you know, childhood dreams where I was a space colonist in the moon) and I understood every single word of Hawking’s books. I have a scientific mind in my head. And yet for the life of me, I can’t write science fiction. I enjoy the genre, but somehow I can’t muster enough energy to write the genre. Maybe I’m not cynical enough… or I have become way too cynical to write properly about the societal changes that science fiction usually studies. Maybe I prefer my world featuring more aliens and magic than Asimov would like. So when Inklings Press opened the submission for the third anthology with a science fiction bent, my first thought was to skip this one. “I don’t like science fiction,” I told myself, an opinion quickly crushed once I went to see The Force Awakens. The final words of HAL in 2010, the movie. Granted I can barely remember the movie now. But that scene, where Jupiter is being turned into a sun to develop further another species within our solar system moved me so much back then that it made me muse about the wonders we are missing that are out there, in the vastness of the universe. Those lines by Arthur C. Clarke changed a lot of how I see the world and what is expecting us out there if we are brave enough to explore. And as such I found a message to convey in my story. The childish wonder of discovering something awesome out in space, and how it could change your outlook on life. I dunno if I managed to convey that in my story. Damn I don’t even know if it will make the cut. But at least I tried. And this whole process made me remember as well a book I read by Asimov. Now, I have read many of his books, but this one struck a chord on me. It was a collection of essays of him musing on writing and one of the things that stuck with me was that at the end of the day, science fiction, at least the good one that you remember later despite how poorly is executed, is about discussing ideas, social messages hidden within it. Science Fiction is more than lasers, blasters and phasers, more than intrepid pilots, daring captains drinking tea and sexing their way to Orion, more than time travel*and rogue AIs in cybernetic bodies surfing the web in a post-apocalyptic land. 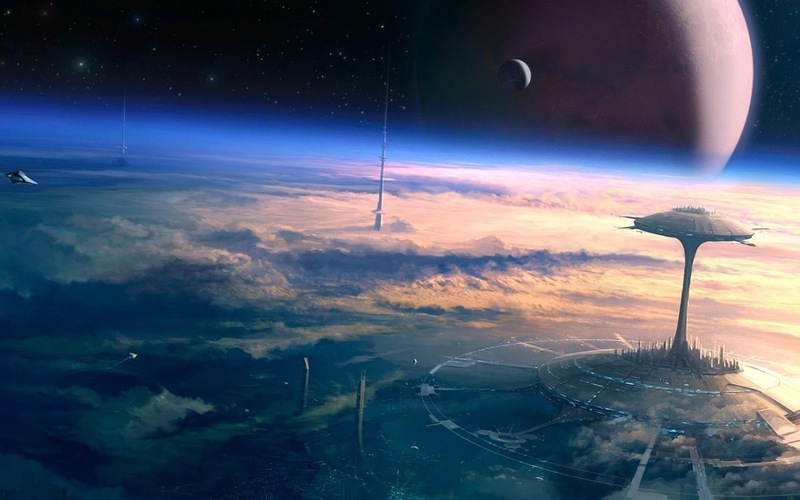 Science Fiction is about reflecting how our worldview changes when new information arrives and exploring the consequences of using such information. Science Fiction is about embracing change and expanding our minds. Even if it ends in a bad joke or in a last question. Because that’s what we humans do: question and reflect. Our communal lives are a big science fiction story yet to unfold. From that point of view, you realize that science fiction is actually easy to write. Writing good science fiction, well that’s another matter altogether. I don’t know if I managed to do so. If my story makes the cut, I hope you like it. It is actually my first science fiction story. Hopefully won’t be the last. But this challenge has moved me into incorporating a bit more of science into my fantasy and more fantasy into my science. The world is already a cynical place, it could very well use more wonders, even if it’s in the form of the written word. PS: I’m still pissed off that we don’t have a colony on the Moon. I was expecting to be travelling there on my old age. Get on it, NASA. *I hate time travel stories**. I just simply hate them. Just a consequence of having a brain wired into the Many-Worlds theory thanks to those early physics readings. ** The only exception to this personal rule is Back to the Future. C’mon, you can’t hate BTTF because is one of the most perfect stories told. Follow Ricardo Victoria here as he continues to wrestle with the challenges of being a writer .